It's the classic question, probably the most reliable way for an adult to get inside the mind of a child imagining life 10, 15, 20 years from now. Common sense dictates we should outwardly deem every child's answer an airtight plan. Whatever you want, you can have. We'll embrace the different versions of those high-achieving future selves—saving a patient's life, discovering a new gene, leading a Fortune 500 company. Privately, however, we may make less rosy predictions, stipulating to certain realities that can impede paths to success, such as income and wealth, geography, race, gender, and educational quality. These residents have decided to aim very high for the community's children and to partner with mentors, teachers, tutors, and other professionals to provide the supports necessary for full college and career readiness. This mobilizing force behind them is the Northside Achievement Zone (NAZ), a Promise Neighborhood collaborative that seeks to end intergenerational poverty in North Minneapolis through education. Through the messaging of NAZ and its partners, the young men are reminded consistently that their plans rest on getting a college degree. At KIPP, a college-preparatory charter school, Jason and his classmates are proud members of the "Class of 2024," the year they expect to graduate from a four-year university. With Josh and Delajuante, Jason participates in an afterschool program called 21st Century Academy, designed explicitly to help middle school–age students prepare for college and career. Nine local schools also partner with NAZ, along with a total of 27 nonprofit anchor organizations including afterschool and expanded learning programs, housing agencies, and early childhood centers. Together, all these actors form a tight circle of support around Northside students and families. These resources may be available in a majority of low-income communities, but the NAZ difference is the way it coordinates and aligns all the partners, and how it champions a Northside "culture of achievement," with empowered families leading the way. NAZ began in 2003 as a North Minneapolis–based grassroots movement to stem violence in the community. 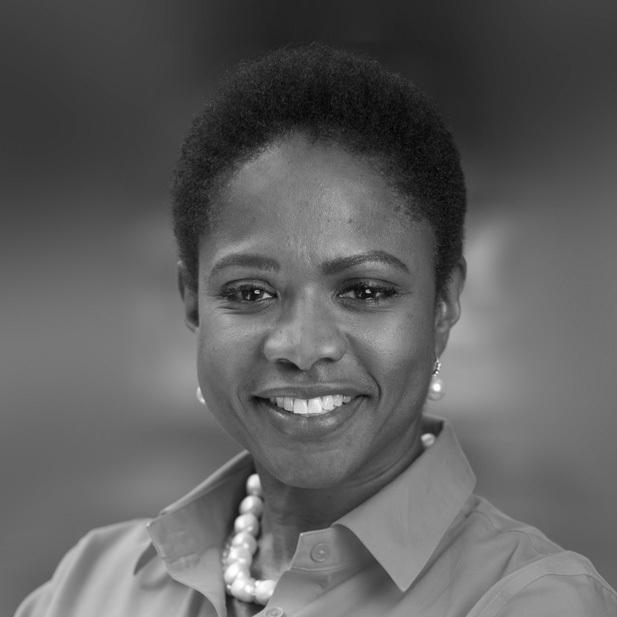 At the time Sondra Samuels, today NAZ's president and CEO, saw violence reduction as the only viable strategy for addressing the homicide crisis among young African-American men and women. (The city's health department reports that between 2003 and 2006, 59 percent of youth victims of homicide in Minneapolis were African-American.) One of her allies, Pastor Andre Dukes, was also working hard on the antiviolence agenda. He remembers hoping never again to have the "unfortunate privilege" of officiating a slain teenager's funeral, or of having to console that boy's mother. Around five years ago, they heard about other urban communities around the country effecting change through education. After identifying the Harlem Children's Zone as a beacon of community transformation, about 50 North Minneapolis leaders decided to pay HCZ and Geoffrey Canada a visit. There they learned the nuts and bolts of a comprehensive support system and how it could help supposedly "unteachable" children reach college. The seed was planted in Northside and a plan began forming for a federally funded Promise Neighborhood program. But first, the leaders wanted to test out their vision with neighbors through a door-knocking campaign. "We asked two simple questions," says Samuels. "'Would you like your child to go to college?' And 'could you use someone having your back to make that happen?'" Both questions drew a definitive "yes." Over the course of convening and planning, the organizers settled on a 13- X 18-block area composing the achievement zone. In those 255 square city blocks live roughly 15,000 residents, many of whom are all too familiar with multi-generational violence and poverty. "Great hearts but often empty hands" is how Reverend Alika Galloway, a co-director of 21st Century Academy, describes her neighbors. Just 43 percent of African-American youth graduate on time from Minneapolis Public Schools. In December 2011, NAZ received a $28-million Promise Neighborhood Implementation grant from the US Department of Education. 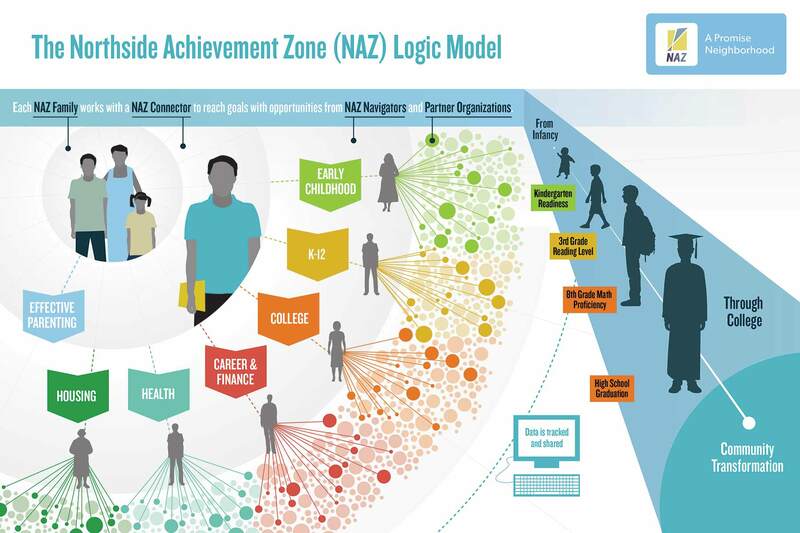 One exciting new development that the grant helped fund was NAZ Connect, an online family achievement plan tool and data-keeping system available to all of the zone's partners. 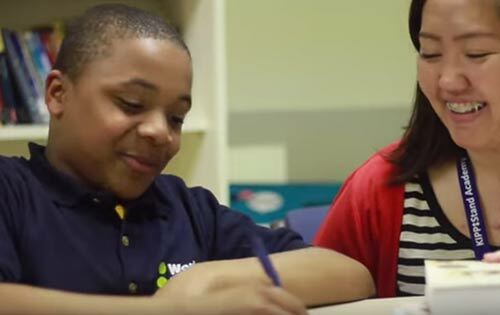 For low-income families, NAZ Connect is the innovation that eliminates the endless hours of paper work and "seat time" in social service agencies. For NAZ staff, it's the tool for continuously evaluating progress toward outcomes and making necessary adjustments along the way. If I don't teach the ones who look just like me to grow up to be a man, I'm setting up my generation for failure. In spite of these high-tech tools and the national profile that comes with being a Promise Neighborhood, NAZ maintains an organic, homegrown feel. Staff members have personal histories with Northside. NAZ manages programs without being programmatic. "At the center of our work is not programs and organizations; it's families and their aspirations," says Samuels. Perhaps the most fitting metaphor for NAZ is the village. For NAZ team members, the village provides the wisdom and the moral imperative to serve, especially for the leaders who grew up in North Minneapolis. Broderick Williams, a staff member at 21st Century Academy, believes his work is mandatory. "Any other culture, you see elders come back and teach their village," he says. "If I don't teach the ones who look just like me to grow up to be a man, I'm setting up my generation for failure." Williams, 24, credits another 21st Century Academy staff member, Tyshawn Blackwell, 36, for mentoring him and guiding his own path. The value of male mentorship isn't lost on any of the men at NAZ. For example, Alvin Abraham, the principal of KIPP Stand Academy, has built a rapport with Jason that will be essential over the course of that long journey toward a degree. "I can joke with [Jason] and have a friendly relationship with him," explains Abraham. "But at the same time, if I see if he's not making expectations either academically or behaviorally, I can have a serious, man-to-man sit-down . . . and he responds so well to that." Another ingredient of NAZ success is specialized support. Abraham and KIPP's teachers benefit from the assistance of Academic Navigators who work on-site at their school. These scholar coaches, stationed in every NAZ anchor school, provide close personal attention, regularly meeting with kids, families, and teachers to provide consistent support and to keep students on track toward their academic goals. Specialized support is also available for a NAZ student's family, should it need assistance with housing, health care, or job training. NAZ Navigators are available to provide personal support in each of six areas, while the NAZ Connectors match children and parents with the right supports and remain a family coach until a student's high school graduation. All this support happens in partnership, with NAZ continually putting the onus on families to take the lead on their achievement plans. The support in the area of early childhood exemplifies NAZ's confidence in families. The Family Academy's classes exist to empower parents as the "first and primary teachers of their children." "They are the best experts," says Andre Dukes, the Family Academy's director. "And we want to equip them with the skills and the knowledge to ensure that their children are ready for kindergarten and can stay at grade level." The Family Academy is yet another place where parents learn about NAZ's long-haul commitment. There they receive baby onesies and toddler T-shirts with "Class of 2036" and "Future College Graduate" emblazoned on the front. All of these supports fold Northside families into one extended NAZ family, building more trust with each new friendship. As vital as the out-of-school academic assistance is that a 21st Century Academy provides, the loving relationships that boost student self-confidence are just as important. "It's just a great place to be," says Josh of the afterschool program. Delajuante feels the same way. "21st Century is like a family to me. It's like coming home to people I can trust and people I know have my back," he says. Ultimately, 21st Century Academy and other NAZ programs have to be like family. The risk is too great that they'll get edged out by the competition: the other Northside "families" running the streets and fighting for the allegiance of young men. NAZ, says Samuels, is mindful of "the little boys whose dads are not there, who feel they are the men of their families protecting their moms and their sisters. We're saying, 'We know you need someone to have your back.'" Promising to "have someone's back" from birth until college is a serious commitment. The reality is that the scope of the NAZ commitment extends even further. Villages aren't made in one day," says Williams. "Villages are first, second, third, fourth, fifth generation." This is the shared long view behind the "population-level change" that NAZ seeks. Pastor Galloway loves to tell a story that hints at where future Northside generations are headed. Recently her young grandson, Jaden, became lost on a school bus after forgetting the location of his stop. Jaden knew to seek help from a familiar face on the bus, Delajuante Moore. The two then went back to Delajuante's home, where the eighth grader gave Jaden cereal and began calling every number he knew to reconnect the young boy with his family. "So you have a Black boy who was lost," said Pastor Galloway through tears. "But another little Black boy said, 'I'll help you find a way.'" How do you ensure effective communications with all of your community partners? NAZ works as a collaborative of 44 organizations and schools, rather than as a top-down organization. Effective communication is key to this partnership. We use three key approaches. There is NAZ Connect, a high-tech tool that allows partners to share information and track the progress of enrolled families and children. This technology gives us an advantage. NAZ and our partners track the progress of every family and every student at every touch point in our system. It helps break down silos across sectors, organizations, and programs. We also host a monthly roundtable discussion with our staff, partner organizations, Board of Directors, and parents to review progress toward goals in the key areas of our work. We review our data and make our outcomes public. This makes everyone accountable for results, and enables us to spot problems quickly and fix what's not working. If we are not reaching our goals, we work together to make adjustments in real time. Finally, our leadership structure includes a small group of leaders from across all partner organizations that meet on a regular basis to discuss progress, goals, and challenges. Each member of this team acts as a lead of one of our focus areas—housing, early childhood, etcetera. How does NAZ help families identify specific goals? Families are at the center of all of NAZ's work. A parent who enrolls in NAZ will partner one on one with a family coach who helps them to define their goals, set realistic plans to accomplish them, and access resources and opportunities from across our system of supports. These goals support family stability and provide a pathway for parents to guide their children toward college readiness. What is the biggest challenge in providing a comprehensive set of services through multiple providers? All of our work is about relationships. There is no manual to guide collaborative work. It's important to maintain the trust and integrity so we all stay focused on our ultimate goal of preparing children for college. Partners have their own board of directors, their own fundraising goals, etcetera. We need to be efficient and effective with the time we spend together or they will not return to the table. Our goal is for partners to be in high alignment, and also taking high action on our collective goals.